It's September! - The Resourceful Room! I always love hearing my husband playing his guitar, well almost always, sometimes when I really need to concentrate it isn't so helpful, and he is usually always playing when he is home!! We had a picnic at the park today, great food, games, family, friends and gorgeous weather!! It was perfect! Now I am home, trying to get ready to go back to work, realizing how much I still need to do, and feeling a bit overwhelmed. I have two new groups starting tomorrow. A fifth grade reading group working on compare and contrast and a first grade group working on non-sense words. I am making some resources for both and wanting to have it really well planned so they get off to a great start! I would love to have someone to cook and clean for me, this time of year I always feel like it's never done, and I just can't keep up. I know it will get better as we all settle into a routine but right now it's crazy!! A few more hours in the day would be soooo helpful!! I would love to jump in the shower and head off to bed early tonight, but it's not gonna happen!! Again back to school season is the season to be totally EXHAUSTED all the time!! I don't feel like I can get enough sleep either!! My three Love Me's are simple, yet I don't do them! I rarely eat breakfast, I am rushed in the mornings and I just don't! I know it's not good for me and I want to change that but I've tried and failed several times now. I am trying to start this week with at least a nutritious fruit smoothie in the mornings. I would also love to get some planing done during my plan time AT SCHOOL, uh huh, at school!! It never happens because there are always people to talk to, kids to help, duties that need to be done, but I am hoping I can get better at managing that time. I have been in the biggest creative slump for the longest time now!! I want to create but the creative juices just aren't flowing, so I'd love to finish just one product this month!! Any ideas for getting started again??? There you have it, what I am up to!! 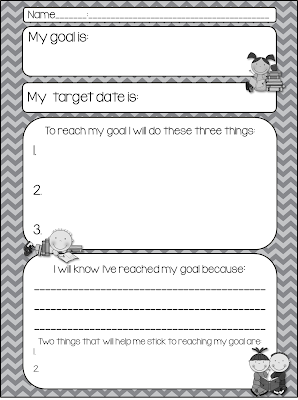 In the classroom we have been working on setting goals for ourselves and I've created a goal planning sheet I wanted to share with all of you! 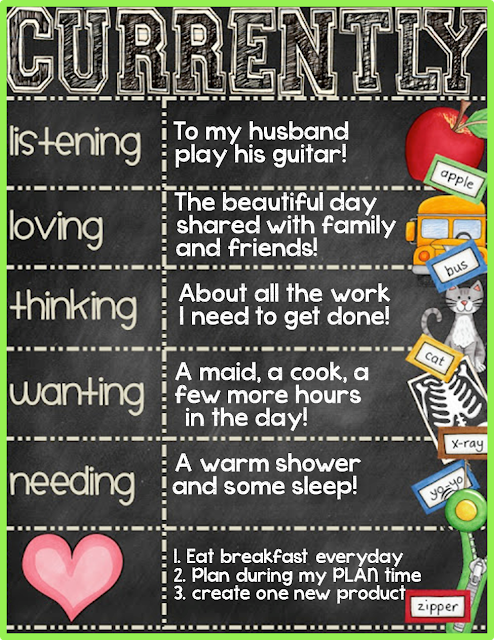 If you want to get your students involved in planning out their own goals, this works great! Click on the picture to pick up a copy for FREE! I hope to be back soon, until then Happy Teaching everyone! I love your goal sheet, I wanted to start doing some goal setting with my class because we do The 7 Habits in our school and this will work great!